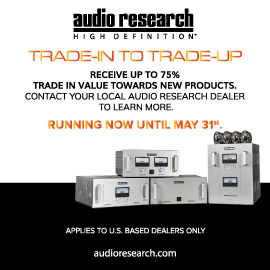 High End, held May 14-17 in Munich, Germany, was off the charts this year -- exhibitors, attendance, and product introductions were all way up over previous years. Which meant that our coverage of the show, appearing on SoundStage! Global as it happened, was our biggest ever. In fact, there was so much to see and hear that I thought it would be a disservice to High End 2015 to do my usual single “Best of Show” report -- I’d have to leave too much out. Instead, I’ll stagger it over three months: this month, the five best loudspeakers I heard at High End 2015; in July, the five best electronic components; and in August, the five best systems. That seems only appropriate for what has become the top hi-fi show anywhere in the world. Paradigm’s Concept 4F was, by a long shot, the star loudspeaker of High End 2015. As “Concept” and its lack of a price imply, it’s not a finished design -- it’s similar to KEF’s Concept Blade, introduced at High End in 2009, and followed a couple years later by the production version, the Blade. Paradigm exhibited the Concept 4F to give High End attendees a strong taste of what’s to come from their next flagship product, later this year or early next. I can’t wait. Paradigm has improved their styling in the last few years, particularly with the new, midpriced Prestige series, but the Concept 4F’s beautiful appearance is a higher rung on that ladder. I particularly liked the way the rear of the cabinet rises, supported on something like the heel of a high-heeled shoe. The vents for the rear-mounted woofers (see below) create nice visual touches of their own. But it’s on the technical side that the Concept 4F really stands out. Its tweeter and midrange both have beryllium diaphragms. Many of today’s high-priced speakers have beryllium tweeters, but use of the material in a midrange is rare -- other than TAD, I know of no company that offers one. Beryllium is desirable as a diaphragm material because it’s superlight and ultrastiff, and, when appropriately shaped, its inherent resonances are pushed to frequencies far above the driver’s specified bandwidth, for cleaner, clearer, lower-distortion sound. In addition, what look like grilles over the 4F’s tweeter and midrange are actually phase-aligning lenses, a proprietary technology first implemented with the tweeters of Paradigm’s Prestige models. The Concept 4F’s woofers are more conventional aluminum-cone types, but there are four of them -- plenty of surface area for launching low-frequency waves. They’re also mounted in opposed pairs that simultaneously fire to front and back, for a reaction-canceling effect that, Paradigm claims, greatly reduces cabinet vibrations. 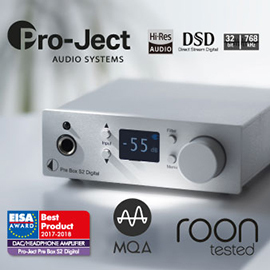 Unlike the tweeter and midrange, which are passive, each pair of woofers is powered by a 700W amplifier, their outputs enhanced by digital signal processing that incorporates Anthem Room Correction (ARC), from Paradigm’s sister company Anthem, widely considered one of the best room-correction softwares on the market. The claimed result: ideally optimized, linear bass output down to 15Hz -- unbelievably low for a modest-sized floorstander. Visually, technically, and sonically, I was blown away by the Concept 4F. Look for info on the sound in this space in August. Tucked away in a booth on High End’s crowded main floor, and thus likely overlooked by many attendees, was a speaker that made as strong an impression on me as did Paradigm’s Concept 4F: the Oval B1 Decade, created to celebrate Vivid Audio’s tenth anniversary. The speaker was also designed to demonstrate not only that Vivid has stayed true to the roots of their original designs -- it’s an update of the Oval B1, their first model, which remains one of their most popular models -- but has made significant advances. Only 200 pairs of Oval B1 Decades will be made. The Oval B1 and Oval B1 Decade look almost identical, but with notable differences. The Decade’s integral stand is still made of the B1’s rock-solid-feeling resin, but while the B1’s cabinet is made of the same material, the B1 Decade’s comprises the high-tech, fiberglass-based sandwich of which Vivid’s flagship Giya models are built. The B1 Decade’s woofers, mounted in opposition, front and rear (again, for a reaction-canceling effect), are derived from those in the newest Giya, the G4, and are said to be superior to those used in the B1. The tweeter and midrange are the same as in the B1, but with a new grille that better protects them (Vivid drivers have long suffered from being dented by prying fingers). The Decade’s baffle isn’t flat around the drivers, like the B1’s; instead, it’s curved to provide a cleaner wavelaunch. Finally, the shapes of the front and rear ports are now more oval than egg-like, and the crossover has been revised to accommodate the new drivers, and to include everything designer Laurence Dickie has learned since the Oval B1’s launch, in 2004. Although I’d heard Dickie was working on it, the appearance of the Oval B1 Decade surprised me. Dickie is notorious for not releasing a product unless he feels its sound is significantly better than anything Vivid is already making at that price point. From what I’ve heard, he scrapped numerous designs because they literally didn’t measure up. That’s his thing: performance above all else. The Decade’s launch seems to indicate that he feels its performance improves substantially enough on the Oval B1’s to justify its release. That’s the good news. The bad news: those improvements come at a cost. The Oval B1 sells for $17,000/pair in the US; the Oval B1 Decade will cost close to $28,000/pair when it’s released later this year. That’s a big jump. But those who really like the Oval B1 and, like me, have admired Dickie’s past speaker designs -- I think Vivid makes some of the best speakers in the world -- will likely have no trouble finding value in the Oval B1 Decade, and will want to seek it out. I sure do. Another speaker possibly overlooked by many High Enders because it was displayed among the plethora of products on the show’s crowded main floor was the AudioSolutions Vantage, from the mind of Gediminas Gaidelis, the company’s founder and chief designer. AudioSolutions is based in Lithuania and has no North American distribution, but a couple of years ago Gaidelis was kind (and ambitious) enough to directly ship to me, in Canada, a pair of his Rhapsody 80s. I was very impressed with their level of sound quality at their then price of $4187/pair. The Vantage is a 3.5-way design with a 5” midrange driver that covers from 200Hz to 10kHz. That exceptionally wide range surprised me, so I asked Gaidelis about it. He told me that the driver’s off-axis dispersion is compromised as the signal approaches 10kHz -- no surprise -- but that its on-axis linearity is superb up to that frequency, and that giving the driver so wide a bandwidth keeps the crossover out of a significant part of the audioband. He feels it’s all worth it. A 1” soft-dome tweeter is used for the frequencies above 10kHz; two 7” woofers cover from 200Hz down to their lower-frequency limit; and a bottom-mounted, downward-firing 10” subwoofer kicks in at 50Hz to help the two woofers reproduce the deepest bass. That overlap in the lows of the woofers’ and subwoofer’s outputs is what makes the Vantage a 3.5- and not a 4-way design. On the speaker’s rear panel are numerous jumper configurations for tailoring the highs and the mids. My experience of his Rhapsody 80 taught me that Gediminas Gaidelis has serious speaker-design chops, and while I couldn’t listen to his Vantage at High End 2015, it looked like a lot of speaker, even at the high price of €30,000/pair -- so it, too, probably deserves serious consideration. I doubt that Gaidelis will be shipping me a pair for review -- each Vantage weighs 150 pounds -- but if what I’ve described interests you as much as it did me, I encourage you to seek out this speaker. The AudioSolutions Vantage is a formidable-looking design I’d get my hands on if I could. Three things distinguish Magico’s speakers from most others: 1) sealed instead of ported cabinets; 2) Rolls-Royce build quality; and 3) copious use of aluminum for the cabinets, inside and out. No surprise, then, to see all three in Magico’s newest speaker, the S7 ($58,000/pair). The S7 is a three-way design with a 1” beryllium-dome tweeter with a diamond coating, a 6” midrange driver with a graphene layer on the cone, and three 10” woofers with aluminum cones. 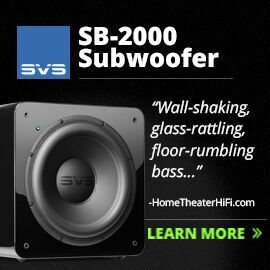 Its cabinet looks similar to that of the lower-priced S1, S3, and S5 models in having a flat front, and rounded rear and side panels of extruded aluminum -- but the S7 is much larger, with a swooping groove cut in it between the woofers and the mid- and high-frequency drivers that makes it more pleasing to look at than the other three, which look kind of tubey. 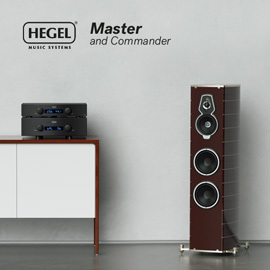 The S7 also seems more technically advanced than the other S models, likely because it was designed immediately after the launch of Magico’s M Project speaker, of which only 50 pairs were made, at $129,000/pair. In fact, when you look at the S7 and the M Project, the similarity of their driver configurations is obvious: midrange at the top, followed by the tweeter and the three woofers. However, the drivers used in the S7 are different from the M Project’s, and so is its cabinet. While the M Project, like Magico’s Q models, is built on an elaborate skeleton of aluminum, with a mix of slabs of aluminum and carbon fiber for the exterior panels, the S7’s cabinet of extruded aluminum is similar to those of the S1, S3, and S5, still with a significant amount of interior bracing. If you couldn’t afford the M Project but want something better than the S1, S3, or S5, the S7 might be perfect for you -- the demo pair in Munich sure sounded good, something I’ll elaborate on in August. As talked-about as any other product at High End 2015 were Focal’s new Sopra speakers: the N°1, a two-way, two-driver, stand-mounted design (stands included); and the N°2, a three-way, four-driver floorstander. The respective prices per pair for the N°1 and N°2 in Europe are €8000 and €12,000; and, in the US, $8999 and $13,999. I and many I spoke with -- including some who work for other speaker companies -- liked both Sopras for their sharp styling and attractive color options. Of the two, the Sopra N°2 stood out for me, for a few reasons: As a floorstander, its size is ideal -- big enough to impress, but not so big as to dominate a room. Obviously, Focal’s designers keep appearance in mind. I also like the way the entire cabinet curves toward the listener, seeming to lean in toward you in a way that looks almost as if it wants to make friends; in contrast, many speakers today are angled away from the listener, which implies distancing itself. The Sopra N°2 is also chock-full of advanced technologies from Focal: a tweeter with an inverted dome of beryllium; midrange and woofer cones made of Focal’s proprietary W material, as in their upscale Utopia series; and a new rear-vent system for the tweeter that purportedly improves treble clarity. I also like that the N°2 is a true three-way design with two woofers, a driver configuration that almost always guarantees near-full-range sound. Finally, there’s the price -- not cheap, but certainly not extravagant for all that’s offered. Like AudioSolutions’ Vantage, the Sopra N°2 appears to be a lot of speaker for the money -- so much that I bet they’re selling well now, given that they started shipping the moment High End 2015 was over. 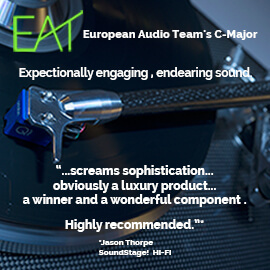 High End 2015 was fantastic not only in terms of the sheer numbers of exhibitors, attendees, and new products, but also for its overall level of quality -- I can’t remember ever having seen so consistently high a level of quality of high-grade loudspeakers at a single audio show. 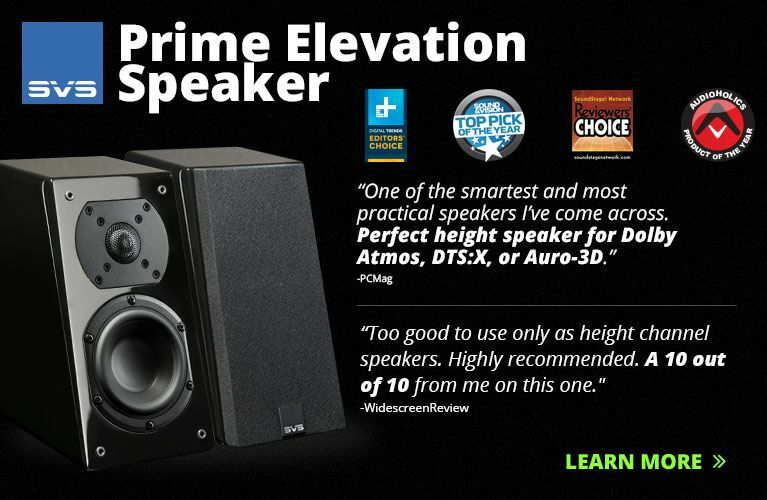 If you’re serious about speakers, you’ll want to look into these -- and probably all of them. Next month, I’ll focus on the best electronics I saw at High End 2015 -- five components whose caliber of sound quality was just as high as these five speaker models’.